Ah, tis the season once again when flowers are in full bloom, the weather is mild, and the Lord watches as photographers everywhere set out to enjoy and document the intricate wonders of His world. 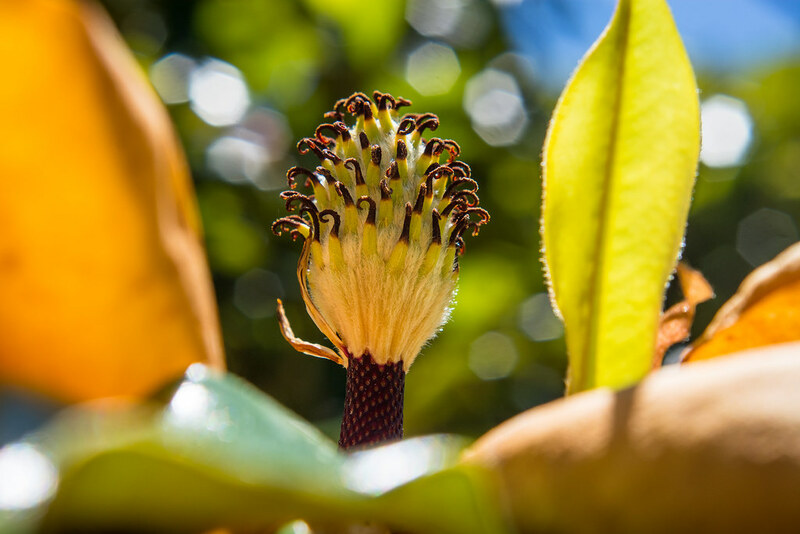 Each summer one of my favorite subjects to photograph is none other than the magnolia flower, as visitors to this blog no doubt know by now, and 2017 has been no exception. Of course I enjoy taking pictures of other flowers as well, but it’s the size, features, and explosions of color that often accompany the magnolia flower that make it such a joy to photograph. Add in a little daylight and a close-up filter and you’ve got the recipe for some pretty cool pictures. This one, like most of the magnolia photos I’ve taken, was on the OSU campus within spitting distance of Theta Pond. I was walking past the tree when I saw several flowers relatively close to the ground, and this particular one a bit above my head which meant that I immediately dismissed it as a potential photo subject. I did take a bit of a detour over to it just in case it turned out to have something of value, photographically speaking, and snapped a picture of it (because why not?) before deciding to move on. If you’re a regular reader you might also know by now that I’m not generally in the habit of chimping, or looking at the screen on the back of my camera, after taking photos. I like to trust my instincts and look at my pictures on a big computer screen, and when I’m looking at the LCD on my camera it’s usually just to check to see if I nailed focus. This time though, I checked specifically to see how the picture turned out and I was honestly kind of surprised. I quite liked what I saw, so I stopped and went back to take a few more. There were a couple of elements in this image that I tried to use intentionally as a way of creating a complete composition rather than simply snapping a shot of this flower. First I used the orange and green leaves in the foreground to frame the subject, which required me to scoot around and shift my viewpoint quite a bit. I know there’s some empty space on the right-hand side but I’m OK with that since it felt just a little too claustrophobic to have the leaves looming large and blocking out absolutely everything on the sides. The second compositional element, which I assure you was quite intentional, was the light spots in the background behind the flower. I wanted them to surround the flower and not intersect with its boundary, and to get this to work properly I actually had to chimp quite a bit while continually adjusting my viewpoint. It might be kind of a subtle effect but I do think it add an altogether not insignificant amount of flair to the picture. There was also the issue of exposure settings: I wanted the flower to be sharp but also wanted a shallow depth of field. F/4 blew out the background a bit too much and f/8 was not enough, so I found a sweet spot at f/6.7 which really did the job nicely. I think the shot turned out very close to what I was going for, and if I compare it to a similar picture I took last summer I actually prefer the newer one because it feels like more of a complete, considered composition. When I opened the email with this weeks blog, I was immediately impressed with the image and the focus being put on the middle of the flower. Everything in the picture seems to work together to place the emphasis on the subject and nothing seemed to draw me away from that. I am glad to know that that wasn’t the first shot you made, but was a deliberate attempt to get the best shot. Sometimes it will take me many attempts before I finally focus in on what it is I am trying to achieve and using the techniques to get it. I use a relatively cheap set of close-up filters that I got from B&H for about $30. They’re not perfect, but you can’t beat the price! Nicely composed and captured. Often the zoom on a lens can be used to blur the background when the f-stop doesn’t seem to get your exposure where you want to be. Well done. Good tip, and thank you for sharing! You’re exactly right, and it works especially well if your subject is far away from the background elements too.